Read this sentence carefully: Humans have found, invented or synthesized over 50 million different chemicals over the course of history, the vast majority of them since World War II. That’s millions of chemicals the human body, or the world, for that matter, has never experienced or adapted to in all of evolution. According to Dr. Hideaki Chihara, Ph.D., chemist and former president of Japan Association for International Chemical Information, a novel substance is isolated or synthesized every 2.6 seconds. With no way to metabolize these new chemicals or combination of chemicals, the body does the next best thing. It sequesters that unknown compound as far from important body parts as possible. The body stores these toxins away from the heart, brain, organs, muscles, nerves and skeleton and dumps them where it can: in fat cells. The more toxins we collect means more fat, bigger fat deposits, a higher ratio of fat to muscle and bone and there you have it: obesity. Add to that the fact that nearly all of these new chemicals go untested, only later do we find that they cause cancer and a host of problems. It’s a Spring Thing. Behavioral scientists say it’s natural for humans to organize and clean up at springtime. Look around. You see Mother Nature doing the same thing. Spring is when we purge the detritus of December and make room for rebirth. Birds are spruce up nests. Squirrels dump trash out of their wintertime hidey-holes. Rain and sun clean away the logjams and dead leaves from the past. So if you feel impelled to grab a mop, some cleaning supplies and get to work around your home, you’re in good company. But while you’re hunting dust bunnies, wiping windows, uber-cleaning Levelors, de-crusting burnt-over pizza cheese in the oven or even Q-tipping the air conditioner vents in the family minivan, you could actually be polluting your space and body with toxic chemicals. Too many modern-day cleaning supplies leave behind chemicals that aren’t Earth or human-friendly. Take a look at some of the chemicals in everyday cleaning supplies: ethylene glycol monobutyl ether, butyl cellosolve, butyl glycol, glycol ether eb, 2-propanol, dimethyl carbinol and more. You don’t need to know what they are or how bad they might be to your lungs, skin, DNA or eyeballs to realize they’re not exactly natural. And no, they’re not exactly biodegradable. 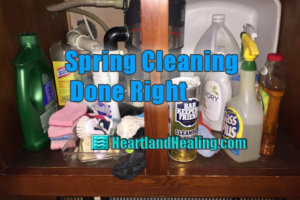 There are ways to clean for the spring that are less harmful to you, your pets and the planet. And I’m not talking about those expensive, supposedly “green”, eco-friendly cleaners either. There are some old standbys that are much cheaper and just as effective or more so. Here’s a list. Plain white vinegar diluted with water is an alternative. It works great as a glass cleaner and can be used to clean and shine many surfaces. As far as safety is concerned, if you can put it on your salad, how bad could it be? Another tip — if you make your own solution, use distilled or reverse osmosis water. That way the water will have fewer minerals and will streak less. A vinegar solution is great for tubs, shower tiles and mirrors. Vinegar is still a natural acid so avoid breathing fumes. Simple ammonia diluted with water is more heavy duty. It’s cheap and is a single chemical. But ammonia is caustic and an irritant so needs to be handled safely. Bathroom: Simple baking soda and a sponge scrubs sink, tub and even toilet bowl. Mix a couple drops of organic Dr. Bronner’s soap. Pour vinegar down the drain and that freshens, too. For heavy duty on the toilet bowl, plain bleach is effective. It’s caustic, too, so take care. Never mix chemicals. Use safety glasses and gloves for protection. But even with bleach or ammonia, you’re avoiding a number of mystery chemicals that commercial cleaners add. Clean air. We love Spring’s fresh-air smell. But for the sake of your health and your kids’, never use those bogus air fresheners that you plug into the sockets or wick into the air. You can search the labels but the makers will never tell you what’s in them. Of course they don’t actually “freshen” the air. In fact, they pollute it with dangerous chemicals. Some even emit a nerve-deadening chemical to blanket room odors. Harmful substances in air fresheners include potential carcinogens acetaldehyde or styrene, toluene and chlorbenzene, glycol ethers, phthalates. Paradichchlorobenzene, formaldehyde and benzene (a carcinogen for which the WHO recommends zero exposure), are common. A safer way to clear the air is to identify the source of any malodor and remove it. To add pretty smells, try potpourri of herbs and flowers or a pomander made of an orange pierced with whole cloves. When your house is clean, it won’t smell. Water. Consider water, nature’s ultimate solvent. Given time, water can erode solid rock. Likewise, it can handle most cleaning situations. Soaking things gives water a chance to work, at least that’s what Eula, my dishwashing co-worker taught me at my first job as a pot and pan washer at Methodist Hospital. Use water wisely and you’ll need fewer bad chemicals. With a little research and wisdom, you can avoid harsh, toxic chemicals and have a sparkling, clean and fresh home to welcome the spring.